Send a Passover Care Package to your child on Campus! The Holiday of Pesach is nearing in just a few days and your dear child is so any miles away from home…Why not send something to let him/her know you are thinking of them during this festive season?! This year, you can do it here in Lawrence @ KU. Send your child a basket, and it will be hand delivered to them before Passover. 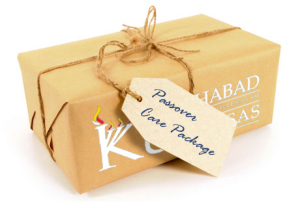 This special Passover Care Package will include: A Box of Matza, Grape juice bottle, Macaroons, Fruit, and Passover candy and treats and it will be delivered directly to your student’s dorm room, fraternity/sorority house, or apartment. Plus add a personalized message from you! All for just $36 per gift package. Additional contributions appreciated, as ALL proceeds to benefit Chabad’s many Passover programs on campus. All for just $36 per care package. Orders should be placed by April 14th to be delivered by April 19. Yes! I would like to partner with Chabad and share the joys of the holiday with hundreds of fellow Jews. Your additional contribution will make a very big difference!